After a great season, Eden Hazard has been nominated for Best Player of the Year award by the Professional Football Association in England. Eden Hazard and Harry Kane are the favorites for the PFA Player of the Year nominations for the 2014-15 season. Diego Costa, Alexis Sanchez, David de Gea and Philippe Coutinho have also been shortlisted. Due to his still young age (24), Eden was shortlisted as both Best player of the Year 2014-2015, as well as Best Young Player of the Year 2004-2015. Hazard has been in a great form stirring form throughout the year at Chelsea, leading his club to almost winning the Premier League with twelve goals and nine assists. The Belgian playmaker, winner of last year’s PFA Young Player of the Year, inspired Chelsea to win the Capital One Cup alongside main attacker Costa, who has made 20 goals in his debut season in England. Due to his still young age (24), Eden was shortlisted as well as Young Player of the Year. Basically, he could win both trophies at the same time. However, for both trophies his main competition could be Harry Kane, who has 30 goals in all competitions for Tottenham and recently marked his England debut with a goal after 79 seconds against Lithuania..
Will Eden Hazard win another trophy? He has won a best player award EVERY year since 2010! 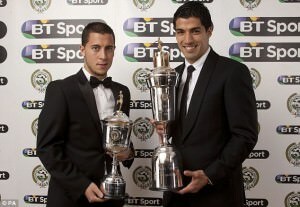 Check out all the awards Eden Hazard has won so far. Rating: 4.9. From 8 votes.